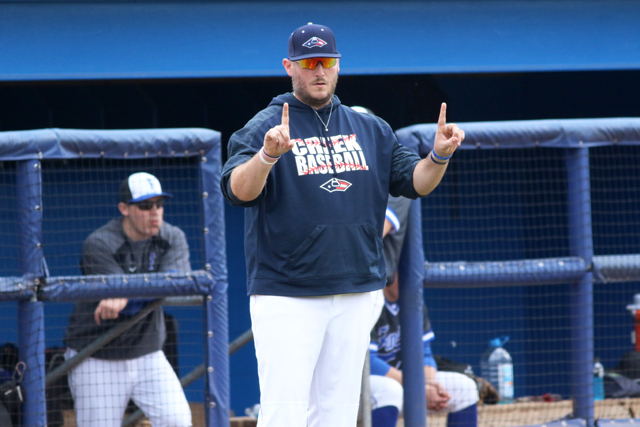 Nick Pou is in his first season as the head baseball coach at Sandy Creek High School. Editor's Note: Nick Pou is in his first season as the head coach at Sandy Creek High School in Tyrone. He previously coaches at Islands High School in Chatham County. His team competes in Region 5-4A. Q: What has been the hardest thing for you in your first year at Sandy Creek? A: The transition to Sandy Creek was not difficult at all. This program and administration has welcomed myself and my family with open arms. They are dedicated to turning this program around and it shows. Just like when any new coach comes into any new program, there’s a learning curve. Guys have had to adjust to some new ways of doing things on and off the field. I think this is true with any program and a new regime. Q: Your region is one of the toughest in Class 4A from top to bottom. How do you prepare to compete against some of the state's top baseball programs? A: The baseball in this region is top notch for sure. There are no off nights. Each team is good! Each team can beat the other. We knew going in that we would have to amp up the strength of our schedule to be able to compete night in and night out in our region. We did that. Out of the 18 non region games this season, 14 have been against teams ranked in the Top 10 in their classification. This group has played one-run games with the likes of Mountain View and Fannin County, split with Redan and Rome. And had great battles with Pike County, Appling County and Northgate. In order to compete in our region, we had to play tough teams. That’s what we did, and we feel like we can compete at a high level. Q: What are your long-term goals for the future of Sandy Creek baseball? A: Our motto is, “The Creek Is Rising!." Our long term goals for this program are already taking place, from facilities to on the field, we have played a tremendous schedule and played extremely well in the majority of our games. Our record does not show the ability or talent level of our squad. We made it a point as soon as I arrived to reach out to the community and their youth. We participated in numerous Free Camps and Clinics around the area and we are seeing our numbers for upcoming seventh, eighth and ninth-graders sky rocket. We are excited about not only the immediate teams we put on the field but the future as well! Q: Name your favorite memory as a high school coach. A: This is probably the easiest one to answer. It’s so easy to pinpoint rings, trophies, wins, banners, etc., as the greatest times for a coach. I tell my guys all the time that those things collect dust. I love to win as much as the next guy, but as a high school coach, it can’t be our main goal. Just recently, I’ve received two wedding invitations to former players' weddings. I get texts or phone calls weekly just checking in from former players. Or the random text that just says thank you for what you did for me. I didn’t see it then, but I see it now. As a high school coach, we won’t see our success until 10 years down the road when we see the men, husbands and fathers these young guys have become.